American and British crosswords. Is there a difference? There are major differences between American-style and British-style crosswords (which are seen in Commonwealth countries too). Crosswords were started by Arthur Wynne in 1913, a British man who lived in America, so both countries claim a close connection with the development of this popular puzzle. They developed in slightly different directions in each country, which has led to the varieties we see today. American-style crosswords are almost exclusively published in America, while British-style crosswords have spread through the Commonwealth — Australia, New Zealand, Canada, South Africa, and other English-speaking nations tend to prefer this variety of the puzzle, as well as the United Kingdom, of course. Note the pattern of black and white squares. Both puzzles have symmetrical grids, and no two-letter words are allowed. In the British-style grid above, there are a lot of black squares. Roughly half of the letters in each word are crossed over with another word (what's called "keyed" or "checked" in the industry). This is known as an alternate-letter grid - in general, every other letter in a word is checked. In the American-style grid below, there are relatively few black squares, and every single letter in every word is crossed over by another word. The grid is fully "checked". So it's theoretically possible to solve a whole American crossword by only doing the Down clues, for example. 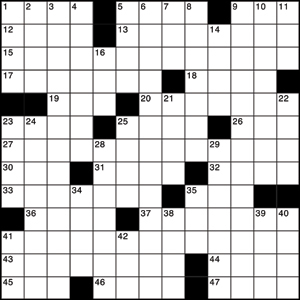 These two different grid designs lead to major differences in how these two varieties of crosswords are created and solved. 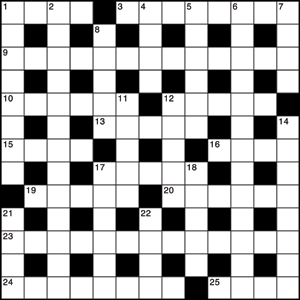 The more open grid structure of the British-style crosswords means that it's much easier for the crossword setter to put a wide range of words into the grid, and they are generally a bit harder to solve, as you get fewer clues for filling in the grid. Both 'quick' definition-type crosswords and cryptic crosswords fall into this design style. The solid grid design of the American-style crosswords makes life much harder for the crossword setter — having every single letter in every single word crossing over another word is really restrictive. Setters often have to resort to abbreviations, names, unusual and archaic vocabulary, foreign words, brand names, sections of words, and other tricks to fill in the grid. Solving these puzzles can be a bit easier than the British-style ones, as if you're stuck on one word, you can look for the words that cross over it for further hints. Just as different grid designs have developed in the two countries, so have different conventions for writing clues. Quick Crosswords - these are straight definition clues. 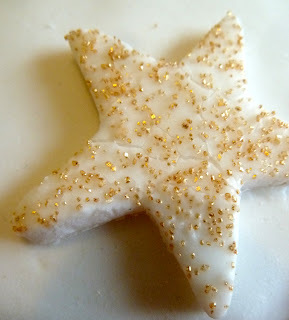 There aren't any tricks involved or any word play. Different levels of difficulty are created by whether the vocabulary used in the crossword is standard or more obscure, and whether clues are specific or general. General knowledge, archaic words, and common words in other languages are often included. An example : Bird (4) = TEAL is a difficult clue - there are a lot of birds with 4 letter names! Small duck (4) = TEAL is an easier clue, as you're given more specific information. Cryptic Crosswords - these fiendish crosswords have the same basis as the British quick crosswords, but that's where the similarity ends! Each clue is a mini-puzzle in its own right. There are a lot of rules and conventions about how these clues are written (see my "Cryptic Class" to learn more about cryptic clues). Each cryptic clue must contain a 'base clue' (synonym for the answer) as well as some word play. This can include double definitions, anagrams, homonyms, charades, puns, amongst many others. An example : Bird colour (4) = TEAL — as TEAL is both a colour, and a type of bird. This is a double definition clue. NB : British crosswords tend to have the letter count for the answer in brackets after the clue, but American crosswords don't. American-style crosswords have a wide variety of clues too. And another major difference with American crosswords is they often have a title and theme. The themed crossword entries are generally some of the longest words in the puzzle, and are placed symmetrically within the grid. Somewhere around three to five words in the crossword will relate to the theme. These theme entries can be words, phrases, or puns, or a whole host of other conundrums. The title for the puzzle usually gives a clue as to the theme. There are the standard definition clues, as in the Brit's quick crosswords. However, there are also a lot of general knowledge clues, such as the names of actors or authors, movie titles, song names, and other trivia. Abbreviations are common; these clues are usually indicated with abbreviations included in the wording of the clue. For example : Some sts = AVES ("Some streets are avenues"). Sometimes fragments of phrases, prefixes, suffixes, fragments of words, and foreign words are used. Fill-in-the-blank clues are also fairly common. There is a wide variety in these sorts of clues; the setter may sometimes also engage in a bit of word play, with pun clues indicated with a question mark. So as you can see, each crossword variety holds its own challenges, but luckily they are all fun to solve!